It’s that time of year . . . you know . . . to be scared of scary things. We see a lot of scary things in real estate . . . a lot of scary things. But it’s our job to shield you from those menacing figures. If my 10 year old daughter were writing this, she would say that in Harry Potter terms, we are the Patronus that casts away real estate’s Dementors. The spell we’re casting here is to warn you about the pitfalls associated with purchasing a tax deed. Although tax deed sales can be lucrative investments, they bear with them a certain element of risk. Tax deed sales in a nutshell: Owner of real property fails to pay property taxes. Third party investors buy “tax certificates,” which they do so that they may collect a bit of interest on the payment. Those certificates, if not redeemed, can after time result in the investor’s application for tax deed. That application, under certain circumstances, results in a tax deed sale and the investor earning the “deed” to the property. Give us a call if you want more details. Again, nutshell version here. The point of this post is to give you very useful insight into what tax deeds look like from our wizardly title insurance perspective. After all, if you purchase a tax deed, you’re likely interested in selling the interest in the property at some point. At that point, you’re going to have to jump through some hoops in order to do so in such a way that is acceptable or marketable, as we say, to a savvy buyer. Here are those steps and what they could mean to you or your investor clients. We are tremendously excited to announce that construction has begun on Winged Foot Title’s new home! Winged Foot Title (well, a separate entity actually) purchased the old Palm Printing building, located at the corner of Jackson Street and Dr. Martin Luther King Jr. Blvd., earlier this year in March. With all the planning and permitting finally in place, the first hammer fell yesterday and the Winged Foot Title team took a field trip to snap some before pictures and to take the obligatory selfie. 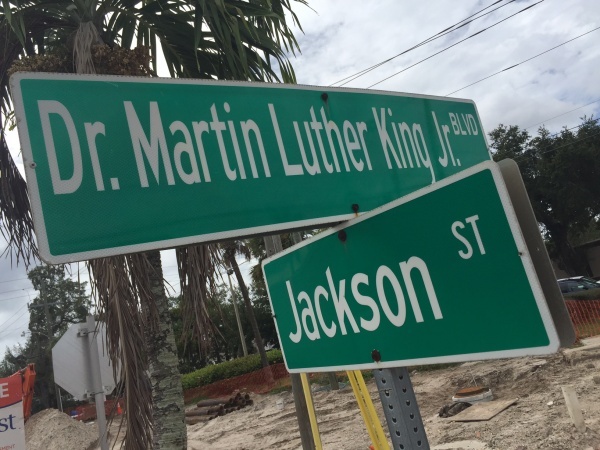 At the corner of Jackson & MLK, Winged Foot Title will be a part of the revitalized and ever-growing Downtown City of Ft. Myers. 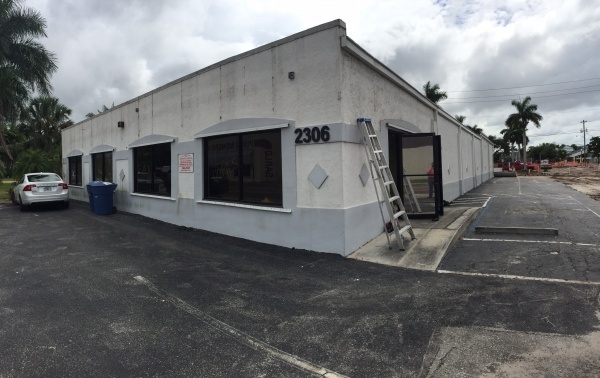 This location also provides the utmost convenience for our southwest Florida clients, with easy access from Cape Coral, North Fort Myers, Lehigh Acres and points east like as well as points farther north and south because of our proximity to I-75. We’re already ALL SMILES about being here! Our reception area will be at the northwest corner of the building, and two beautifully appointed, modern yet comfortable conference rooms will be nearby. Our office hub will be located here (left). This picture was taken facing south. Ten private offices will line the periphery of the interior space. We have retained the center space for a flexible and open work space as well as a space to accommodate educational seminars and meetings for up to 50 guests very comfortably. 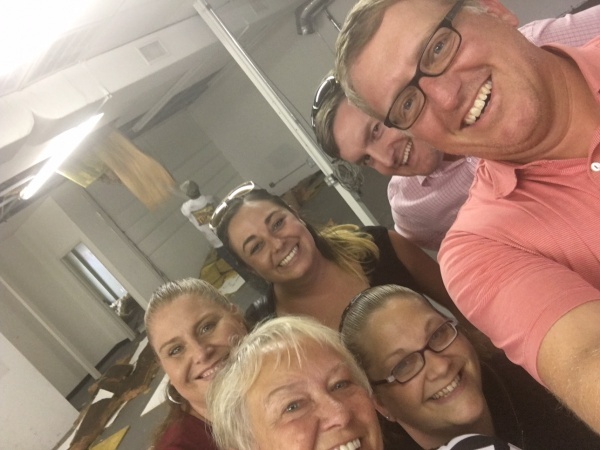 Where the team is standing we’ll have a kitchen, bar (we are in the real estate business after all!!!) and dining area. Of the almost 6,000 total square feet, Winged Foot will occupy about 3,950 on the north side. 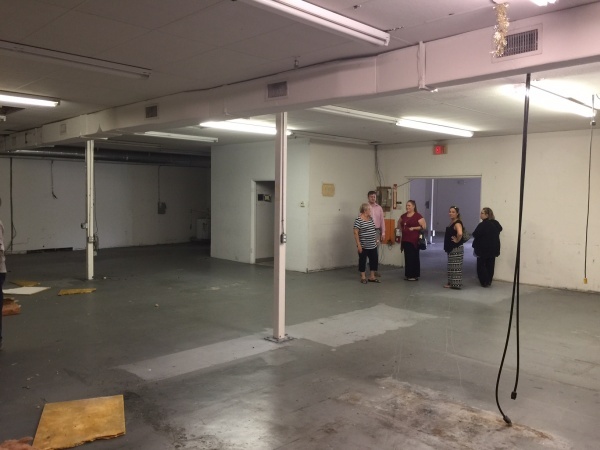 So, we’ll have another approximately 1,880 square feet for lease. This unit, like the rest of the building, will have newly cut windows and will have its own signage and entrance on the southwestern corner of the building. It’s not much to look at at the moment. But everything’s coming out and the exterior will get a much-needed facelift, with new stucco, windows, aluminum awnings and cool entrance feature. One of the nicest things about the new location is the neighboring park. To our east is Bennett-Hart Park, which our guests, clients and team members will get to enjoy. We’ll look forward to continuously updating you on the project’s progress. Should you have any questions for us in the meantime, please don’t hesitate to call or email. It’s time for another installment of #ClosingWithACause. This month, we’re going back to the well in support of a team favorite local non-profit – the Gulf Coast Humane Society. We will donate a portion of our revenue from June to the GCHS. And THANK YOU, as always, for your support of Winged Foot Title and our charity of the month. Welcome back! In Part 1 of “Tax Prorations Explained for Florida Real Estate Closings” we looked at WHY we prorate taxes and the contractual rules by which we typically prorate. Now let’s look at how to understand how those prorations work. Cont’d. 3. Which accounting period is used? Florida real estate taxes often include different types of taxes and assessments. For example, we have ad valorem taxes, which are based on the appraised value of the real property; and, we have non-ad valorem taxes, which are based on other elements. These taxes and assessments are sometimes assessed by their taxing authorities on different accounting periods. Some use the calendar year while others use a fiscal calendar. This is where things can begin to get understandably confusing. When we prorate, we must use the proper accounting period for each tax and assessment. In the example above, ad valorem taxes are assessed on the calendar year – from January 1 through December 31. And the Lee County Solid Waste Assessment, as you see below, is assessed on a fiscal calendar from October 1 through Septmeber 30. In our experience, taxing authorities who use a fiscal calendar for accounting typically use October 1 through September 30. You should take note here that the typical fiscal calendar uses an end date that could extend into the year after your closing. Irrespective of the accounting periods, all of these taxes are payable with your current year’s tax bill. In Florida, taxes for the current year are due and become a lien on real property on November 1. Make sense? If not, please let us know! So, knowing the taxing authority’s accounting period for a given tax or assessment is an integral part of getting your prorations right. 4. When is your closing date? Remember when we talked about the contractual provision that prescribes how we are to prorate taxes at closing? It says that taxes and assessments shall be prorated “as of the day before Closing.” This is of course important because it tells us the “through date” for the prorations. Simple enough. If you have used the standard form FAR form and your closing is on October 29, 2015, the prorations made at closing would be made through October 28. 5. What is the amount of the assessment to be prorated? Our contract says that we must use the actual tax or assessment; or, if that amount cannot be determined, we must use the amount from the preceding year as an estimate. To determine the right amount, we have to use both the accounting period and closing date. We can make some generalizations based on what we’ve discussed so far. If your closing is between January 1 and September 30, you would estimate the amount of the ad valorem taxes (calendar year) based on the preceding year’s amount; and, you would be able to use the actual amount for any non-ad valorem assessments accounted for on a fiscal calendar. If your closing is between October 1 and October 31, you would estimate the amount of all taxes and assessments based on the preceding year’s amount. And if your closing is between November 1 and December 31, you would be able to determine the exact amount of all taxes and assessment by reviewing the current year’s tax bill. 6. Are the assessments paid or unpaid at closing? This is another crucial question which we must answer in order to prorate properly at closing. If the assessments have been PAID by the owner/seller at or prior to the closing, then the seller will receive a credit from the buyer for days during which the buyer will have owned the property but for which the seller had paid. On the other hand, when an assessment or tax has NOT BEEN PAID at or prior to closing, the buyer will receive a credit from the owner/seller for the days during which the seller owned the property but for which the buyer will pay in the future. 7. Calculating tax prorations for closing. Have a headache yet? Thought so. Hopefully this will simplify things for you. The image below is a screenshot of our title processing software’s proration section. It should provide a clear example of how our system does the math based on the variables we’ve discussed thus far. Let’s explore a little using our must-ask questions. What accounting period is used? See the “time period” column? That is the accounting period. Here, we’re dealing with two periods – Jan – Dec & Oct -Sep. See that? The closing date is reflected in the “thru” column. Here, that’s Oct. 28, 2015; and, that will be the date through which our prorations are made. The “time period” and “thru” date result in the “days” which will be prorated. What is the amount of the assessment/tax to be prorated? The total amount, not surprisingly, is located in the “Total” column. Are the assessment paid or unpaid at closing? 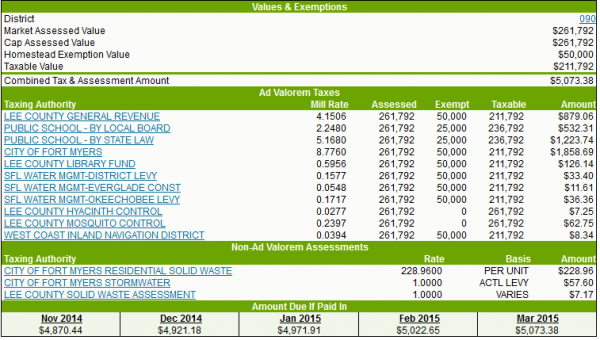 Let’s look at the 2015 Ad Valorem taxes in detail. The actual amount of the taxes is $4,779.65; the taxes are assessed on a calendar year from Jan through Dec (365 days). Based on those numbers, getting the per diem (i.e., the per day amount) for our calculations is easy – divide $4,779.65 by 365 = $13.0949/day. Luckily, the system counts the number of days from Jan 1 through Oct 28 – 301. So, 301 times $13.0949 = $3,941.57 (rounded). So . . . the seller will credit the buyer that amount on the settlement statement at closing. Make sense? We sure do hope so. We also know that this is a lot of information. If you have questions about your taxes and prorations at closing, please don’t hesitate to call us at 239-985-4142 or contact us online. Until next time! It’s that time of year! Real property taxes in Florida will be assessed any day now. Until they are, calculating tax prorations at closing can be a confusing affair. If you are curious about how tax prorations should work for your closing, please read on. 1. Why we do Tax Prorations for Florida closings. The main reason we prorate taxes at closing is because your contract demands it. More on that in just a bit. The rationale for this type of contract provision is pretty simple. At closing, the Seller might have paid taxes for a period that extends past the closing date. In this case, the Buyer should credit the Seller for the days during which the Buyer will have owned the property but for which the Seller paid. Alternatively, taxes may be unpaid for a period during which the Seller owned the property but for which the Seller could not have paid because many of our assessments in Florida are paid in arrears. In this case, the Seller should credit the Buyer for that period during which the Seller owned the property but for which the Buyer will pay when that tax becomes due and payable. Make sense? If not, please contact us and we’ll go through it with you. 2. What does your Florida real estate contract say? We are delighted to announce that this month’s charity will be Gulf Coast Humane Society. From the discussion at our most recent team meeting, it is clear that everyone in the Winged Foot Title office has been touched in some way by GCHS. GCHS provides adoption services and veterinary care (even to the public!) and does so without any federal or state support. Check out this video to learn a bit more about GCHS and how you may be able to help. We would love to learn about your experience with GCHS or a similar provider. Have you adopted, donated or volunteered? Please share your story in the comments below. And thank you for helping us to support this great organization! 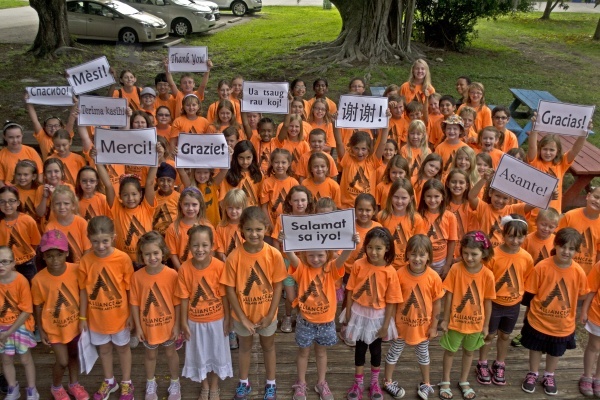 In June, Winged Foot Title raised $400 for the Children’s Home Society of Florida. What a great cause! This month, a member of our team and a veteran herself recommended that we do something for the Florida Veterans Foundation. A portion of this month’s revenue will go directly to the Foundation.